You have to use an Ottopress to get fresh squeezed Otto. Added a new feature that people have been asking me for since I created SFC to begin with: Comments Integration. When you make a post with SFC, the publisher plugin has the ability to push that post to either your Facebook Page or Profile. Up until now, the auto-publish feature has been doing this and storing meta-data with the post about the resulting “story” id that Facebook sends back. This data was stored, but not really used. No longer. Now, if you auto-publish to Facebook, you have the option to pull comments back from that automatically published Facebook post and show them in the blog as if they were normal WordPress comments. You can see this in action here on my own site. 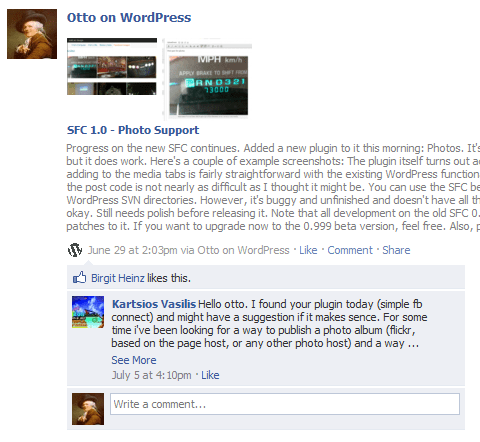 On the SFC 1.0 Photo Support post, you’ll find a comment at the bottom made by a user named “Kartsios Vasilis”. That comment wasn’t left here on this site, it was left on the Facebook story corresponding to that post. As you can see, the avatar for the user shows up on the comment, it’s styled differently (I felt the blue background sort of distinguished it), and it doesn’t have a reply link. Since these aren’t “real” WP comments, and don’t live in the WP database, you can’t reply to them properly. So the reply link is automatically removed for them. I used a styling rule in the CSS to add the “This comment was originally made on Facebook, so replying to it here is not allowed.” message where the Reply link would normally be. Because this is just using a simple CSS style rule, you can make that message anything you like, or not have it at all. That’s up to you and your theme. The new feature is relatively painless too. No configuration is needed. Every 6 hours (minimum), the plugin will retrieve the relevant comments from the Facebook posts, then store them as a transient. This reduces the amount of work since it doesn’t have to talk to Facebook every time. The comments are then integrated in with the normal comments for the post, and the comment count is updated to reflect the right number. There’s still some minor detail work to be done. Right now, for example, the comments are just added onto the end of the list of comments, and so they’re out of order. The final version will have the comments integrated in correctly by the date and time they were made. Edit: This is now working, comments are added in the proper order. If you want to use the beta version of SFC (currently marked as version 0.999) you can find it in the WordPress Plugins SVN repository. content:"This comment was originally made on Facebook." Nice one Otto! I’ll be grabbing this version to test out when I get home!! Figured I’d report back…. Great job on this Otto. Upped it onto VoodooPress and tested it late last night. When I woke up this morning, there was my comment waiting for me. Very cool feature! Cool, could you use this on a facebook fan page? Yep. Works with Fan Pages, Apps, or Profiles. could you use this on a facebook fan page? When I activate SFC 0.25 and STC 0.15, I can log in to comment using twitter but the Facebook comment iption is just simple text, no link, no button. How can I have both options activated so users can choose to comment using either twitter or facebook? P.S. Are there plans for a Simple Google+ Connect? I am running a bilingual WordPress website using the WPML.org plugin and I’m using your latest beta files of your SFC plugin. I am trying to get the Facebook Comments language to be in French on the French part of my website but it doesn’t work. I uploaded the sfc-fr_FR.mo file in the sfc plugin’s root directory but it doesn’t do anything. Any idea where the problem is or where I could edit the code to make it work and translate properly ? “User ID and Access Token found! Automatic profile publishing is ready to go! Application Access Token found! Automatic application wall publishing is ready to go! I’m not using any other social/sharing modules, everything seems to be working perfectly but comments left on Facebook are not coming back to the blog… It’s been about 48hours since the first comment posted to the Facebook fan page but nothing has come back… the only potential plugins i could see that might interfere that I’m using are domain mapping and hyper-cache? i’ve cleared the cache a few times as well but nothing changes… any advice on troubleshooting? I have the same problem! did you manage to solve this issue? Where this comment will appear in facebook? Hi, is it possible to integrate fb and wp comments? I need to mix on my site fb and wp comments one after another. For example, a registered visitor leaveing a comment on site and after his comments (in the same column) fb registered visitor left comment without registering on my site but with his fb account. Sorry on my english! Great Plugin – One question though: Since the FB comments that are pulled into the blog aren’t really live in WP, how can they be moderated after the fact? For example, say someone leaves a comment on FB, and it’s pulled into the blog, but then I realize it’s spam. I delete the comment on the FB wall – but the comment still shows up on the blog post in WP – and, since it’s not part of the WP commenting system, I can’t delete it. Or can I and I just haven’t figured it out yet? Thanks!! Wait 6 hours and it’ll go away by itself after it’s removed from Facebook. I just try to implement FB connect in comments like is here , I added code ->div id=”comment-user-details”<- etc. to comments and after click button all is ok, is connecting to facebook but after logged to FB accont I have error "sfc_update_user_details is not defined" , and script stop work, and I can't write comments use FB. Where is problem and how possible to fix it? Sorry bother you again, but I´ve added the CSS code on my style.css file but the text “This comment was originally made on Facebook.” is not being shown. Should I do anything else? At the top of your post here, when you mean ‘auto-publish’ to Facebook, does that mean I have to set up my blog to auto-post it’s entries to my Facebook page for this commenting to work? If that’s the case, I would rather not do that…but I wanted to check with you. Yes, that’s exactly what it means. If you don’t have posts on Facebook for your blog posts, then there’s nothing on Facebook for the people there to comment on and no comments for the plugin to pull back from there onto the blog. Ok, I get ya. Question: Is there any way to make this if I post to my Facebook manually? I’m betting you’re gonna say no but I wanted to check. Cool plugin but I’m a tad lost. Got it configured with a fan page but it isn’t pulling in any recent activity or posts. The fan page ID is inserted by still bugger all? Am I missing something here, perhaps at the app creation stage??? i can’t get sign in with Google to work SGC its the redirection 0auth thingy what to do ? Need to post PHP code? Wrap it in [php] and [/php] tags. This page, by Otto, is licensed under a Creative Commons Attribution-ShareAlike License.